This wild mushroom soup recipe is hearty and intensely flavorful. It packs a real punch with dried porcini, plenty of wild mushrooms, and the surprising addition of mascarpone cheese! Mascarpone is an Italian cheese made from both milk and cream, resulting in a high fat content. It's spreadable and very rich, as well as being expensive. If the expense and fat turns you off you can leave it out, but it's worth it here to splurge! It's a fun addition to a wild mushroom soup recipe. This is a great soup to whip up after a successful day foraging in the woods. I slightly adapted it from Jamie Oliver's Real Mushroom Soup. 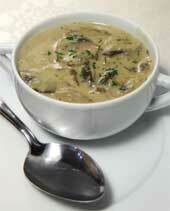 Recommended mushrooms: All edible mushrooms work well in this soup, but it's a great recipe to showcase wild ones. Use chanterelles, shiitake, porcini, or morels. You can mix and match as well, just don't pair really strong flavored mushrooms with more delicate ones. Rehydrate your dried porcini by covering it with boiling water and letting it soak for 10 minutes. As it's soaking, clean your wild mushrooms with a damp cloth and slice them into medium-sized pieces. Melt the olive oil and butter in a large soup pot over medium heat. Add the wild mushrooms, garlic, onion, and a little salt. Let the mixture cook for 5 minutes, stirring frequently. As it's cooking, remove the rehydrated porcini with a slotted spoon and set them aside. Strain the remaining liquid through a coffee filter to get rid of any dirt. Trust me, it's worth it to go through these steps to have grit-free porcini! Add the porcini mushrooms and their soaking liquid to the pot. Allow it to cook until most of the moisture evaporates. This really concentrates the taste, making it one of the most flavorful wild mushroom soup recipes going. Pour in the stock, bring it to a boil, and then reduce the heat to just a simmer. Let the soup simmer for 20 minutes. Normally I'm too lazy to remove half the soup, blend it, and then pour it back in again. However, this wild mushroom soup has an amazing texture if you do it. I'd really recommend it here, although if you don't it will still be excellent. Finish by stirring in the mascarpone cheese, lemon juice, and any salt or seasonings. Delicious! Add a few teaspoons of dried herbs such as thyme and parsley, or spices such as cumin. Add 1/2 cup white wine when you pour in the porcini liquid. Allow it to almost completely cook away. You don't have to use the mascarpone if you don't like it. You can leave it out or substitute with ricotta cheese. If you want the soup to still be a little creamy, stir in small amount of half and half or cream until you reach the desired consistency.